Affordable Adventures Caribou hunting in Labrador, Newfoundland, Quebec Canada - also bear hunting in Canada, outfitters, guides, black bear hunting, bear bow hunting, archery, black powder hunting, big game hunting, B&C, boone & crockett, musket hunting, bear, deer, moose, outfitters, hunt, guides, blackies, moose, moose hunting, accommodations, lodging, guides, atlantic salmon, salmon flyfishing in canada, wilderness, primitive hunting, muzzle loaders, muzzleloader hunting, traditional modern bow hunting archery. pending the results of recent number surveys. Quebec's tundra region is a vast land of rolling tundra ridges and brawling rivers, a land still young and unfettered, where you can find clear horizons and solitude. Its southern boundary is the Taiga located some 600 miles north of New York City, to the west are the steely waters of Hudson Bay, to the east the cold waters of the Labrador Sea which stretches north like a giant horseshoe around Ungava Bay. In all, this land of the Inuit covers some 300,000 square miles. This is the land of the Inuit. A total of 8,500 Inuit and a smattering of whites from the south call Nunavik, home. While many reside in Kuujjuaq (Fort Chimo, population 1,450) most live in scattered settlements along the shores of Ungava and Hudson Bay, clinging to the ways of their forefathers and at the same time adapting to the innovations from the south. Their culture dates back some 4,000 years and they've adapted well to the rigors of their environment. It's a way of life basically dependant on fishing and hunting for sustenance. While the Inuit have adopted many of the white man's inventions, they retain an inbred ability to understand the ways of the animals with which they share this vastness; an ability to comprehend the migration habits of the fish, animals, birds and predict their patterns. 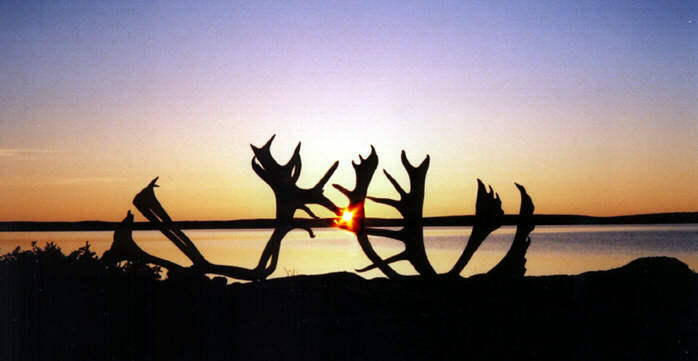 For this also is the land of the caribou. They roam free and wild across the tundra ridges, great herds that wonder through the seasons, forever following the restless winds. An adult female caribou will weigh approximately 200-250 lbs. and generally will have a calf with her. Adult Stags will weigh 400 lbs. or more and have racks up to 60" wide. 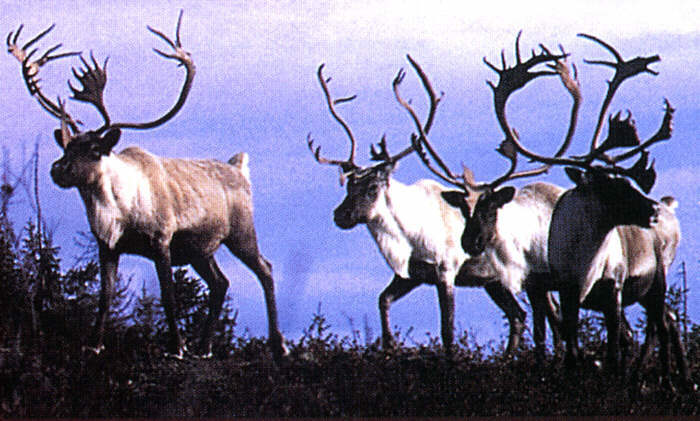 Migration Caribou have their calving grounds in Northern Quebec and Labrador. The migration begins as small groups start moving across the vast area towards feeding grounds and rutting areas. Their routes to the wintering areas will depend on the weather and the food supply. We offer the serious hunter an opportunity to hunt this majestic game animal in a pristine wilderness area. You have a choice of American Plan Guided hunts -or- Modified American Plan self-guided hunts! The American plan will be of interest to those hunters who wish all the conveniences including meals and the services of experienced guides. The Modified American plan will be attractive to the hunter who wishes to experience an unguided "hands on" hunt where meals are prepared by the hunter using supplied utensils, cooking facilities and, of course, food. New firearm regulations have been enacted, and took effect January 1, 2001. For information on these rules and the necessary forms you can contact the Canadian Firearms Center at 1-800-731-4000 or visit them on the web at http://www.rcmp-grc.gc.ca/cfp-pcaf/index-eng.htm. Weapon requirements are; •	Rifles - Minimum of .243, Recommended - .270, .30-06, .300 Mag. For Black Powder users, .50 caliber. For Bow users - minimum 45 lb. For more information on packages and availability, please contact us. These hunting packages are popular and participation is restricted so if you are interested, please call early for availability and booking information.